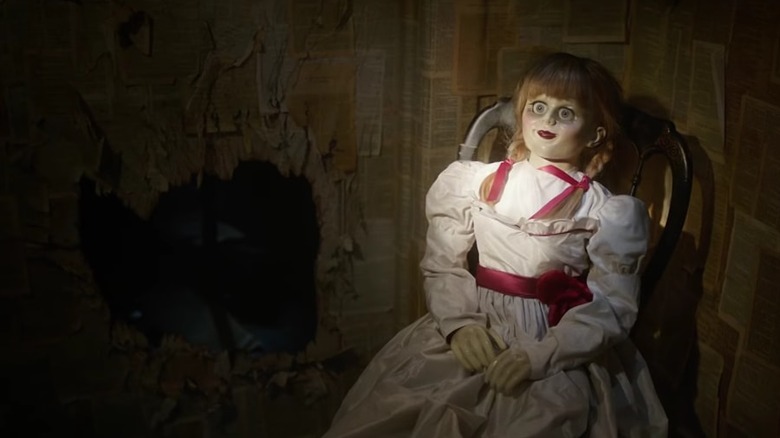 Since its initial release in August 2017, Annabelle: Creation has scared the pants off millions of horror fans the world over. 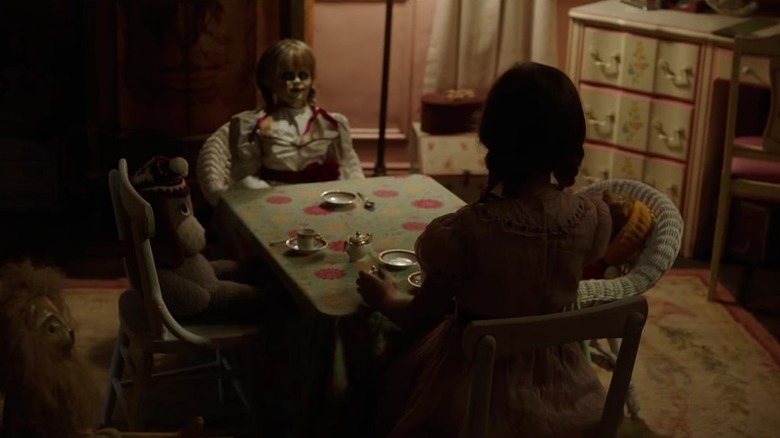 As the prequel to 2014's Annabelle and the fourth installment in the ever-growing film franchise spawned by The Conjuring, David F. Sandberg's Annabelle: Creation presents viewers with the origin story of the titular demonic doll, while also effectively tying together both past and future film releases. In doing so, however, the movie has left some horror fans with more questions than answers. Before we can get into explaining the ending and post-credits scenes of Annabelle: Creation, we must first take a quick look at the events that unfold in the Mullins' spacious (and haunted) house. After the Mullins' daughter Annabelle is tragically run over by a car in 1943, the couple decide they just can't go through life without their little "Bee." As a means of coping, they make a deal with the Devil, so to speak, by both inviting and permitting their daughter's spirit to live permanently inside the film's porcelain doll—itself a limited edition masterpiece handcrafted by Mr. Mullins. Of course, it doesn't take long before the Mullins discover that it isn't really Bee's spirit staring out the window and having tea parties with her toys. Instead, it's a terrifying evil being, yet unnamed, who proceeds to cripple a helpless Mrs. Mullins. Since letting an evil, violent spirit continue to haunt their house for the rest of their days isn't really an option, Samuel Mullins—with the help of some Catholic priests—lines his daughter's closet with scripture, locks the porcelain doll inside, blesses the house, and puts an end to the demon's evil doings. With both the evil spirit and its new favorite toy trapped in the closet like R. Kelly, peace returns to the now-definitely-not-haunted-save-one-room house. At least, until Sister Charlotte and her six orphan girls show up, providing the child-loving demon with a fresh body to inhabit. Having plenty of extra room in their spacious and lonely house, the Mullins generously invite Sister Charlotte and her six orphans to live with them as a means of "penance." The arrangement works out just fine until Janice, one of the younger orphans who happens to be crippled by polio, unknowingly releases the aforementioned evil spirit by letting her curiosity—and possibly a little trickery from another evil spirit—get the best of her. After Janice opens Bee's locked closet, horror predictably ensues, as the once-trapped evil spirit proceeds to terrorize the household, possess Janice (the weakest of the girls), and kill both Mr. and Mrs. Mullins. Before more havoc can be wreaked, however, Sister Charlotte saves the day by miraculously shutting both the possessed Janice and accompanying porcelain doll in the Bible-wallpapered closet, barring the door, and calling the cops. By the time the 5-0 show up and take a look inside the haunted closet, however, the possessed Janice has escaped via the tried-and-true method of simply smashing a hole through the wall. Only the doll is left behind — now apparently free of any and all evil influence. With no reason to stick around, the orphan girls leave and—unless they're terribly unlucky—have no further run-ins with evil spirits. As far as we know, they all live happily ever after, despite having survived a psychologically scarring experience. Fast forward to 1967, where Creation ends and Annabelle starts. As a means of tying the plots together, we witness an adult, cult-member "Annabelle" come home, greet her parents, and brutally murder them. The ruckus, of course, wakes up a pregnant Mia Form and her husband, John—the central characters of the first standalone Annabelle movie. Plots connected. Credits roll. Everyone leaves the theater freaked out. 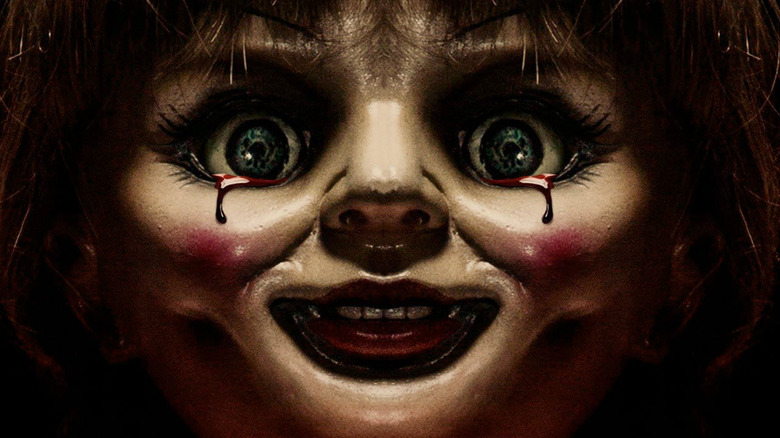 "We made the first Annabelle as a standalone movie," Peter Safran explained to CinemaBlend, "[and] knew we'd made a successful movie. You start thinking about where can you go with it, because it's a great character. 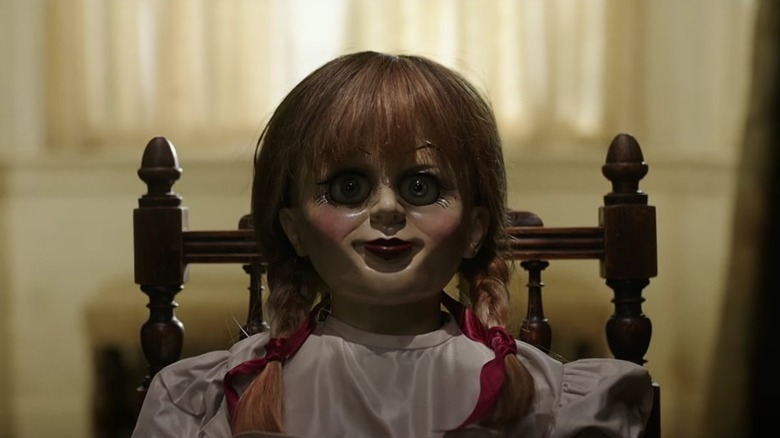 It was actually [writer] Gary Dauberman … it was his idea to go back and give the real origin story of Annabelle. And I think it is feathered into [Annabelle], in a really clever and innovative manner at the end of [Creation]. I think people will be really satisfied with the way that they dovetail together." 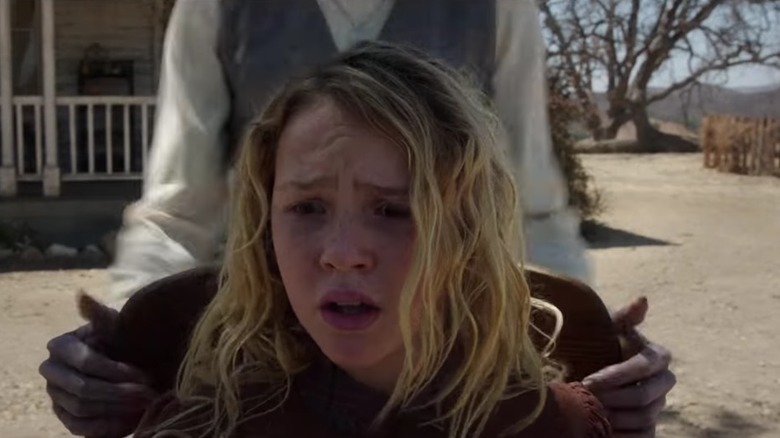 Though Creation doesn't exactly explain why it took "Annabelle" 12 years to murder her adoptive parents, it does accomplish a lot more than simply connecting the dots. Creation helps us understand a lot more about the first Annabelle than we ever knew before. What isn't explained by Creation, however, is how exactly the Ram's favorite toy—the doll—went from chillin' in the Mullins' creepy Bible closet to living right next door to Ram-possessed Janice's adoptive parents. Talk about a coincidence! Of course, there's no way it was pure happenstance. And though it could be a simple retcon, there may more to the Ram's plaything than meets the eye. Shockingly, in the first post-credits scene—or, rather, the mid-credits scene—we see Annabelle sitting in the Higgins' bible-plastered room. Meanwhile, we hear the music box from The Conjuring play its little jingle while we all wait patiently for the sudden jolt to inevitably occur. When the jump-scare finally happens, and you've hopefully succeeded in not peeing yourself, we see Annabelle's head quickly turn towards the camera. This split second marks the first time we've ever actually seen Annabelle move on its own. But did it really? Probably not. Since the room housing Annabelle appears to be undisturbed, it's safe to assume the mid-credits scene takes place before Janice unlocks the door—meaning the Ram, who hasn't disturbed the Higgins for 12 years, is still trapped inside… and probably bored out of its mind. Thus, the evil spirit was probably the one who turned Annabelle's head—not the doll itself. The real question here is: if Ram was trapped in the closet with its toy soulmate, who tricked Janice into setting it free? It would be easy to assume that there's only one foul spirit at work in Annabelle: Creation, since we're led to believe the Mullins lived in relative peace before Janice freed the evil spirit we're calling "the Ram" from the closet. But if that's the case, who did Janice see the first time she rode the stairlift? And who left Janice notes like Bee used to leave her father? And who unlocked Bee's bedroom door? And who turned on the record player? And who, more or less, walked Janice step by step through the whole demon-freeing process? Lucky for us, we know exactly which demon we're talking about. As the primary baddie in The Conjuring 2 and titular antagonist in Corin Hardy's upcoming horror film The Nun, we already know Valak is a mainstay of the Conjuring Cinematic Universe, so it makes sense that the demonic spirit would show up and start causing trouble in Annabelle: Creation. In fact, the film shows us Valak at least three times. We first catch a verifiable glimpse of Valak when Sister Charlotte shows Mr. Mullins a photograph of her and four other nuns at Cârța Monastery in Romania. When the light catches the photograph just right, Mr. Mullins comments on something we all see—asking Sister Charlotte who the mysterious, ghost-like figure standing behind the other nuns is. Sister Charlotte, confused, claims she doesn't know…but we know. The second time we catch Valak at work is obvious. While sitting alone in her wheelchair outside, Janice is pushed by some kind of evil-looking nun-like figure into the barn, where she's subsequently possessed by the Ram. Since we know Sister Charlotte was inside the Mullins' house at the time, and since the figure looked…well…like a nun, we know damn well it was Valak. The third Valak spotting takes place in the second post-credits scene, in which we witness The Nun walking through the eerie hall of what is almost certainly a monastery, blowing out torches as it progresses towards the camera—an obvious tease for Hardy's upcoming film. Those might not be the only time The Nun shows up in Annabelle: Creation, however. Was The Nun there the whole time? In addition to the three times we're all but certain we witness Valak in Annabelle: Creation, there are actually some other instances in which we probably saw The Nun having some fun. Take, for instance, when Janice first tries the staircase chairlift. Once she gets to the top, we witness a ghost walk past in the darkness of the hallway. If the Ram was still locked away with the porcelain doll, what's it doing walking around upstairs? Another instance in which we might've seen Valak at work is when the two older orphan girls are staying up past their bedtimes, giggling uncontrollably in their miniature tent made of bedsheets. While joking about the mystery of Mr. Mullins' yet-unseen wife, both girls begin to hear Mrs. Mullins' bell ringing—normally signifying she's in need of assistance. However, nobody answers the bell, which gets closer, and closer, and closer…until, finally, it's clearly in their bedroom. Audiences are then treated to a heart-stopping jump scare as a womanlike evil spirit briefly appears, causing the girls (and us) to freak out. It's totally possible that Annabelle: Creation's primary evil spirit caused both of these specific frights. Still, given the fact that The Nun certainly was the one who pushed Janice into the barn, it makes sense that Valak was around the entire time. And if Valak really was the one who helped Janice free the Ram, does that mean both evil forces are in cahoots? With the financial success of Annabelle and Annabelle: Creation, it's clear that the brains behind the franchise are interested in building an even larger cinematic universe. And from various hints and Easter eggs hidden within Creation, you can bet it's not going to stop with The Nun. "We have a board that we created that has what we hope will ultimately be our series of movies," producer Peter Safran told CinemaBlend. "We have it in chronological order, so we can keep track of where it all happens." Still, Safran knows they might've already made some mistakes. "I mean, listen, we've already messed it up," he admitted, "I'm sure—from the first Conjuring to Annabelle. I know we did, but we were trying to be pretty careful about it, and you're absolutely right. At some point, you will be able to watch in order: The Nun, Annabelle 2, Annabelle 1, Conjuring, Conjuring 2, you know." That also means that, as time progresses, we'll have even more heart-stopping instances to pick apart, argue and speculate about. Until then, like when a music box starts winding down, we wait in anxious anticipation.